Just got a heads up that the wonderful people over at GNU used one of my pictures in their Happy Birthday to GNU-video. I am of course a big fan of open source in all shapes and forms, so this is simply an honor and a delight! I said jokingly to my wife that “it felt like as if the Dalai Lama had quoted me”, which of course is a SLIGHT exaggeration, but you get the point. I am not a great photographer, so when someone, anyone wants to use an image it simply makes me REALLY REALLY HAPPY! See the video below, or go to http://www.gnu.org/fry/ to view or download the original. It’s probably a coincidence, but this is the third time in just a few months where someone has used one of my images in some way. They are all on flickr.com and they all have Creative Commons licences, most of them for commercial use as well, making it easy for anyone to use them as they wish. I am not a professional photographer, so I really have no urge to sell them. If anyone want to use them, then fine! 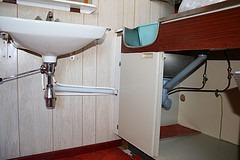 Now, this image of my plumbing is just awful, and I suppose that was the point. I took it as documentation before renovation, it sure ain’t art. But still, it is wonderful to be wanted! www.schmap.com/sanantonio/tours_tour3/p=2048D03/i=2048D03_10.jpg and take a look in the right hand corner. 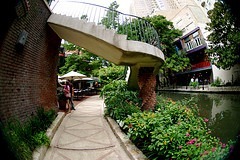 The image was also printed in the Fifth Edition of the Scmap San Antonio Guide. Schmap also makes their guide available in widget form, letting you embed the guide in your blog etc, looks something like this. 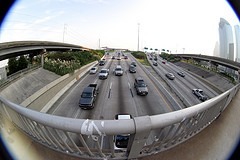 This Highway-picture was used in an article about Houston in an online magazine for expatriates called Global Connection. I don’t have access to it, so I don’t know what the finished article looks like. I have followed a few debates about how “amateur photographers” encrouch on the livelihood of professionals, making it harder to make a living. There might be some merit to this, but I also believe that there is room for both. The access to cheap or free images makes it easier for more people to create, to write about and promote good things. Just like Google Maps and other map apis created an explosion in new services and mashups, sites like Flickr with a well organized way to search for pictures published with a suitable creative commons licence will lead to a richer flora of online and printed works. And I believe that the work will be a better world for it. Imagine the price of creating a school textbook “in the old days”, it would cost a small fortune in royalties for the images used, often images used purely as illustration of a concept (like pollution). These days, a writer, teacher or pupil for that matter could do a quick search on Flickr and find just about anything they need, for free, and with the permission to use the material in eighter a commercial or non-profit setting. Magic!